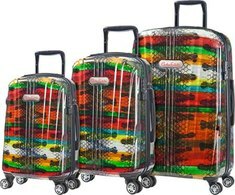 Colorful Snake skin pattern luggage set by Carlos Falchi. Molded with a lightweight and super strong Polycarbonate shell. Each case has eight 360 degree spinner wheels that allow the bag to stand up and be wheeled around and can be turned and maneuvered more easily through the airport. This travel case has hidden and adjustable telescoping pull handle, with a fully organized interior with fabric curtains and tie-down straps. Features top and side ergonomic handles for ease of lifting and carrying, self-healing nylon coil zippers with extra large zipper. 21″, 25″ and 29″.